The Sinking of great Stones through the Action of Worms. 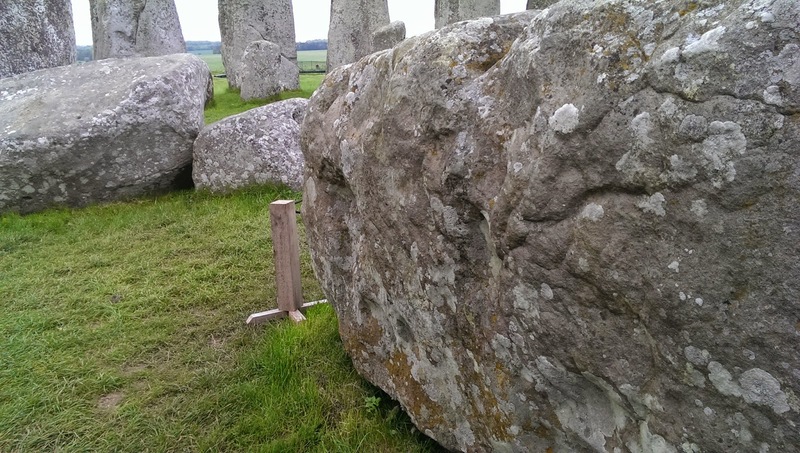 At Stonehenge, some of the outer Druidical stones are now prostrate, having fallen at a remote but unknown period ; and these have become buried to a moderate depth in the ground. 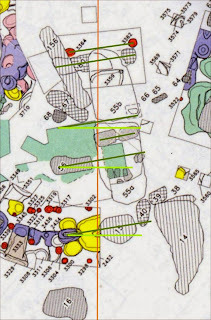 They are surrounded by sloping borders of turf, on which recent castings were seen. 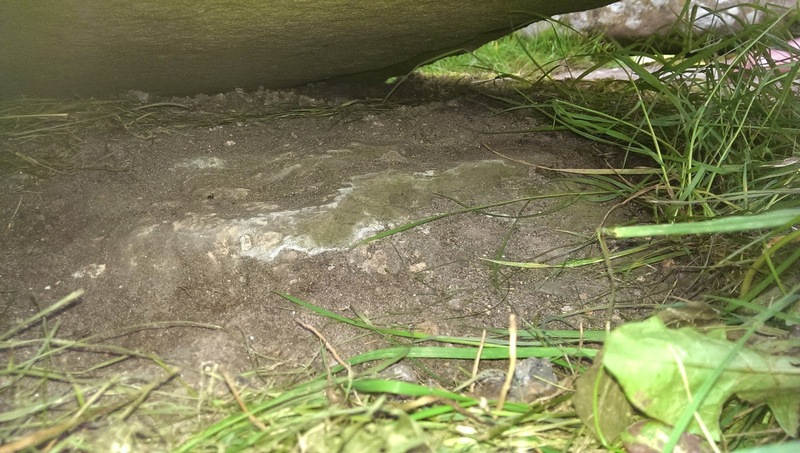 Close to one of these fallen stones, which was 17 ft. long, 6 ft. broad, and 28 inches thick, a hole was dug ; and here the vegetable mould was at least 9 inches in thickness. 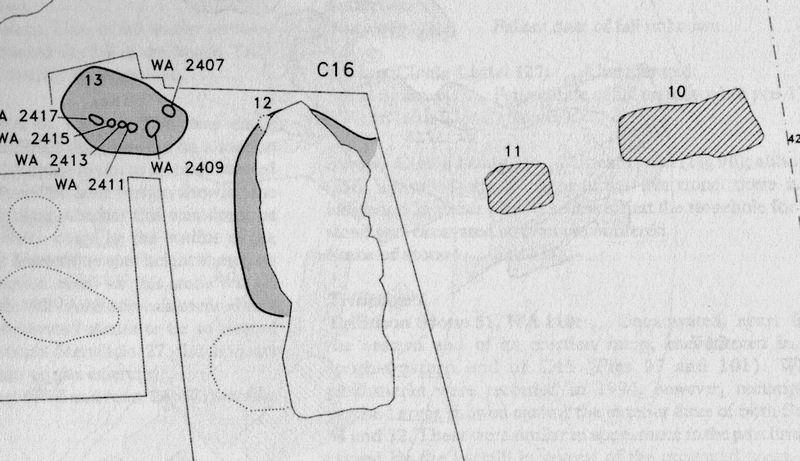 At this depth a flint was found, and a little higher up on one side of the hole a fragment of glass. The base of the stone lay about 9 inches beneath the level of the surrounding ground, and its upper surface 19 inches above the ground. 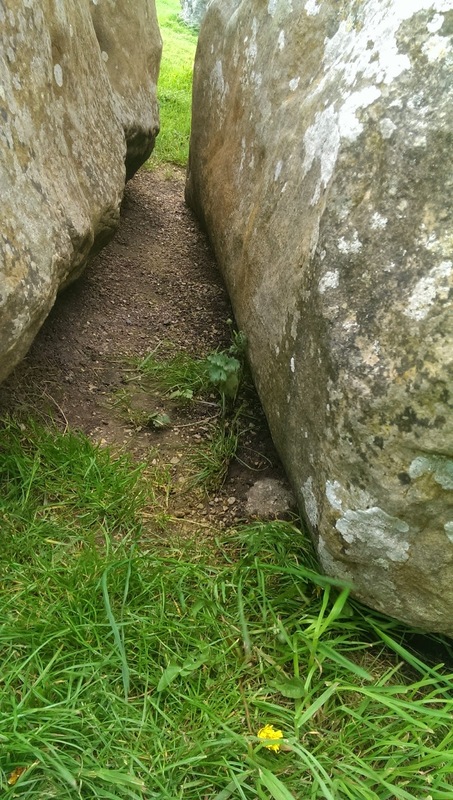 A hole was also dug close to a second huge stone, which in falling had broken into two pieces; and this must have happened long ago, judging from the weathered aspect of the fractured ends. The base was buried to a depth of 10 inches, as was ascertained by driving an iron skewer horizontally into the ground beneath it. The vegetable mould forming the turf-covered sloping border round the stone, on which many castings had recently been ejected, was 10 inches in thickness ; and most of this mould must have been brought up by worms from beneath its base. 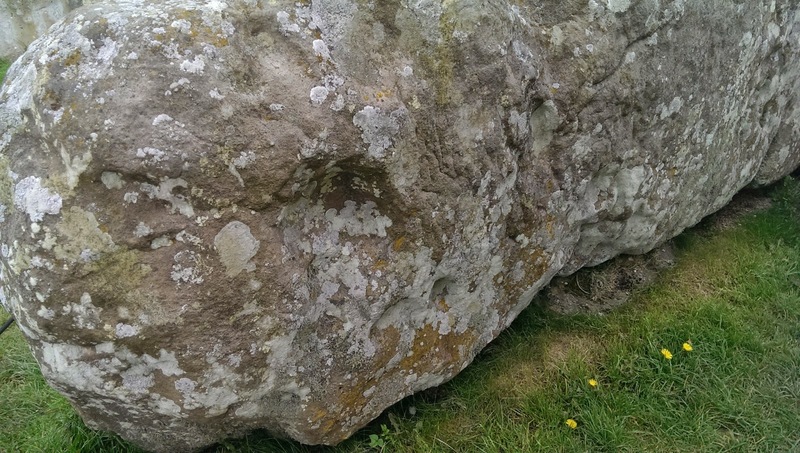 At a distance of 8 yards from the stone, the mould was only 5 inches in thickness (with a piece of tobacco pipe at a depth of 4 inches), and this rested on broken flint and chalk which could not have easily yielded to the pressure or weight of the stone. 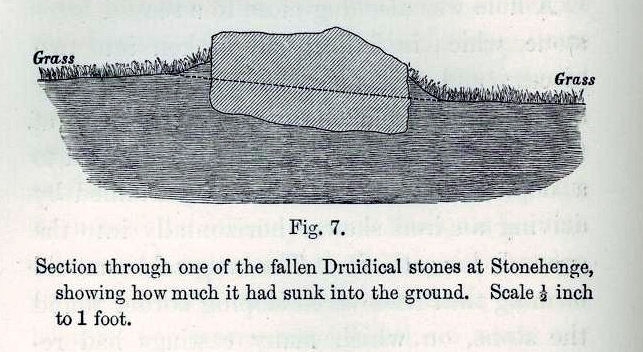 A straight rod was fixed horizontally (by the aid of a spirit-level) across a third fallen stone, which was 7 feet 9 inches long ; and the contour of the projecting parts and of the adjoining ground, which was not quite level, was thus ascertained, as shown in the accompanying diagram (Fig. 7) on a scale of 1/2 inch to a foot. I noted that there was a discrepancy in areas, and I couldn't work it out so I jotted down some notes. Old Ordnance Survey Maps - from old-maps.co.uk/maps.html - show how the various bits of land were measured at various times. 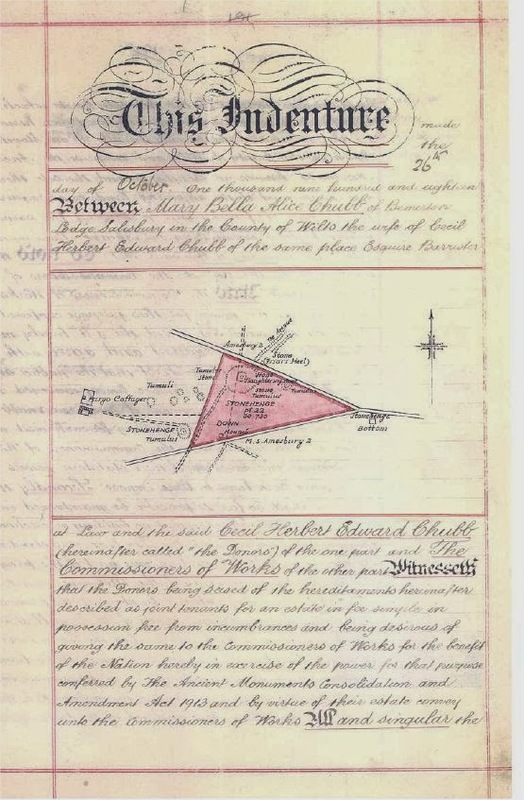 Including the byway the parcels are measured at 29.09 acres in 1924 and 29.01 in 1939. It is worth noting that the old A344 is given a different parcel number before and after the Deed of Gift as parcel number 12. (click to enlarge map) so I presumed it should not have been included in the original measurements. So we have 1 3/4 acres missing. But if the roadway was included in the acreage http://www.magic.gov.uk/ gives the part of parcel 12 which adjoined the original (halved to only take it to the middle) as just under an acre. And if the same exercise is undertaken on the A303 a similar amount can also be added. (Width of the road may have changed over the years so complete accuracy is impossible). So problem solved? And proof that the original gift of land included the roadways to their middle line? 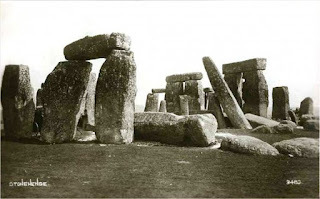 Some time ago I postulated that the Great Trilithon was skewed by the builders of Stonehenge so that not only did the Midwinter Solstice Sunset shine through its centre (the Midsummer Sunrise is on the same alignment) but that the Midwinter Solstice Sunrise was also aligned to the angle of the stones, and therefore the Summer Solstice Sunset as well. 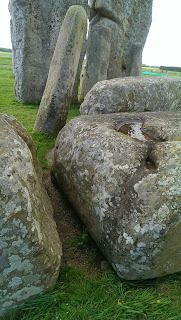 More details are at http://www.sarsen.org/2012/07/stonehenge-resurrection-alignment.html and in my Stonehenge and the Winter Solstice leaflet. By twisting the Great Trilithon across the main axis they cleverly acknowledged the two angles. The Altar Stone also lies at this twisted angle across the axis - see http://www.sarsen.org/2012/06/twisted-56-and-altar-stones-and.html Of course we aren't sure if the Altar stone was originally in this position or not, but there is at least a possibility that it was. Quite a strong possibility I think. 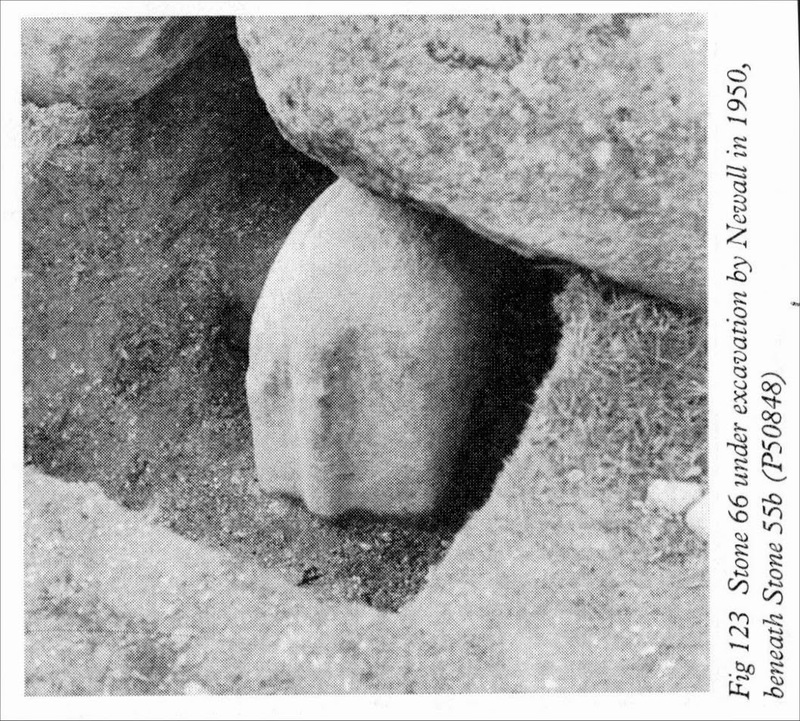 To the north east of the Altar stone there are two post holes which we know little about, they may be part of a structure or simple post holes, further north of them has been so excavated in previous centuries we will never know. These posts are again on this same twisted alignment. 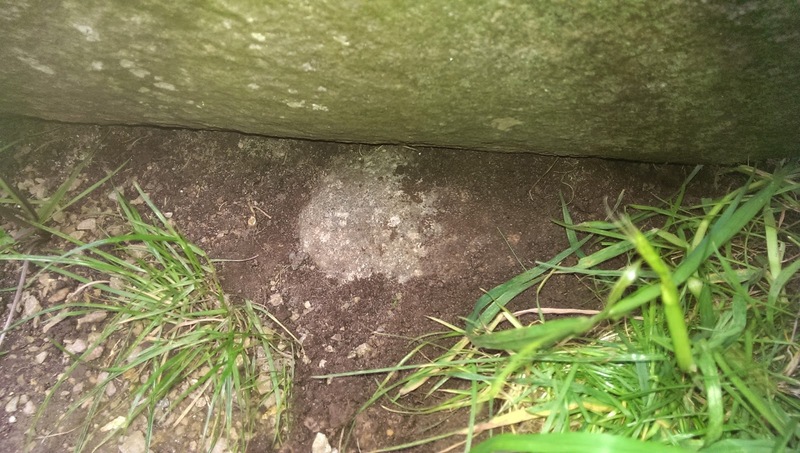 The outer Bluestone circle is badly damaged at the axis and largely unexcavated, but it seems to again be twisted to the alignment. 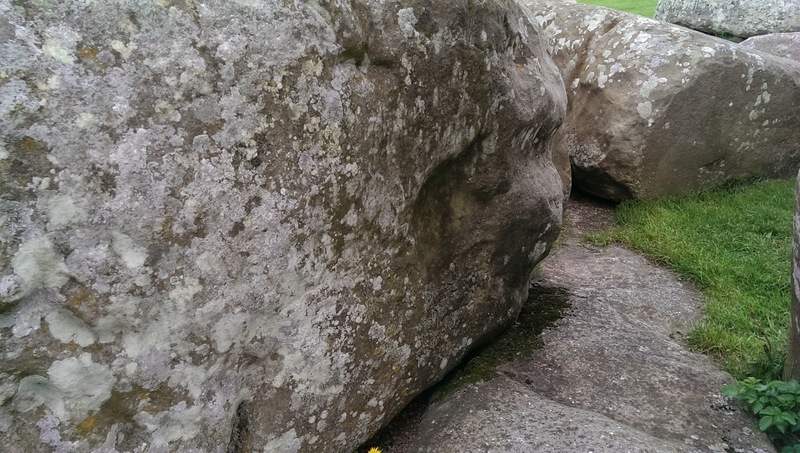 The end of the inner Bluestone Horseshoe has been damaged by the fall of the great trilithon. 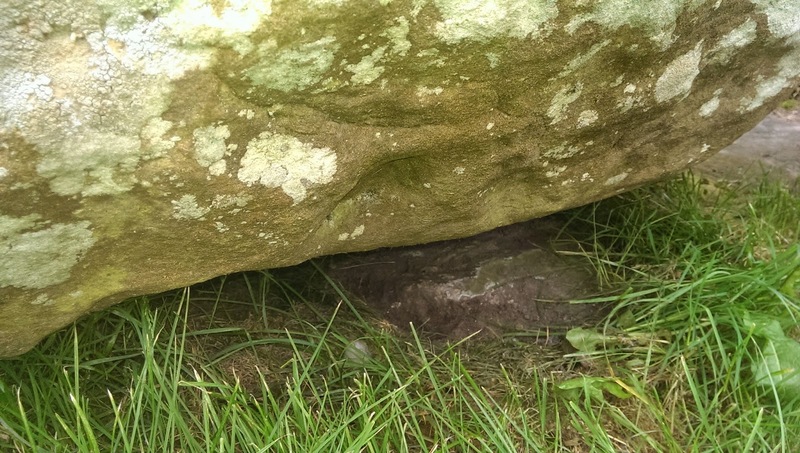 The central stone, stone 67 lies flattened on the ground but the two either side of it survive in damaged form. 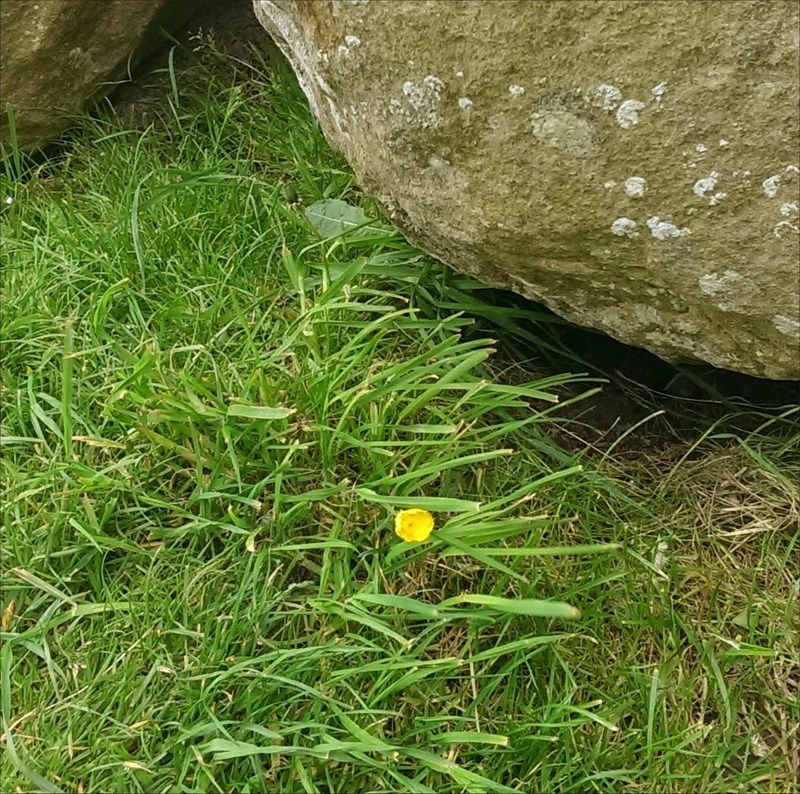 The easterly stone, stone 66, has a tongue on it and the stump of it lies under the edge of Stone 55. 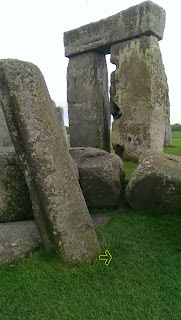 I show pictures of it at http://www.sarsen.org/2014/05/an-extra-stone-at-stonehenge-is-spotted.html. 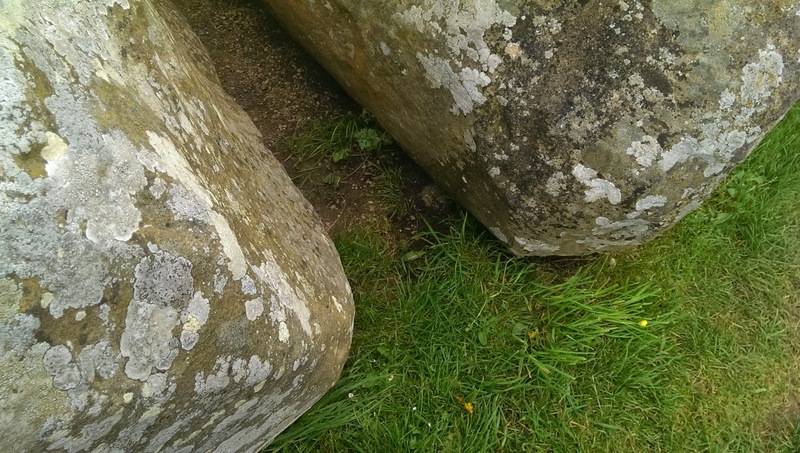 The westerly one, stone 68 has a groove down its length and stands leaning as shown in http://www.sarsen.org/2014/05/original-position-of-stone-68.html . Because of its lean it is mapped on the plan north of its original position. If it was restored to the vertical it would be further to the south. 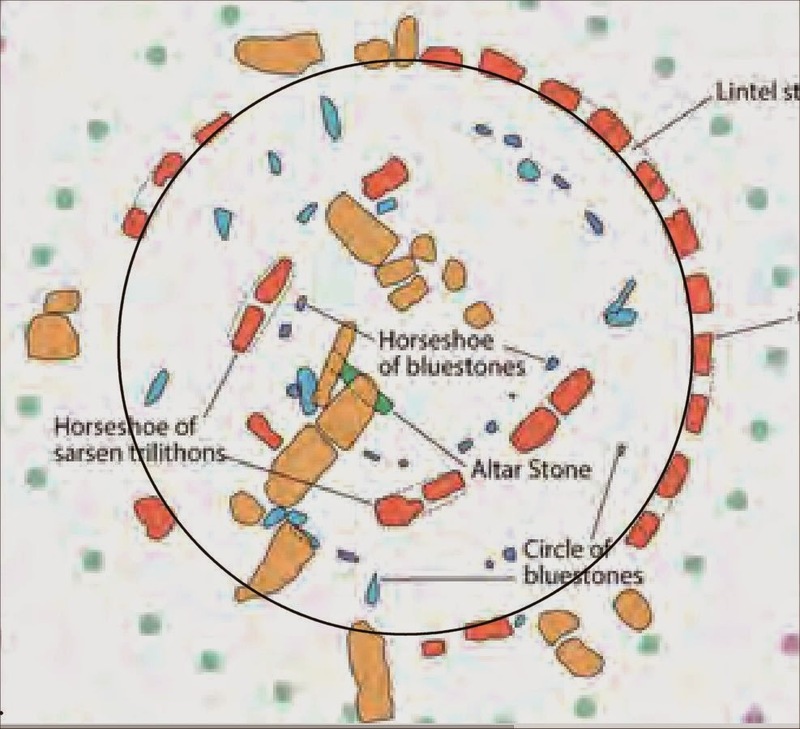 The two stones define the shape of the end of the horseshoe. It was again twisted to the same Midwinter sunrise alignment. 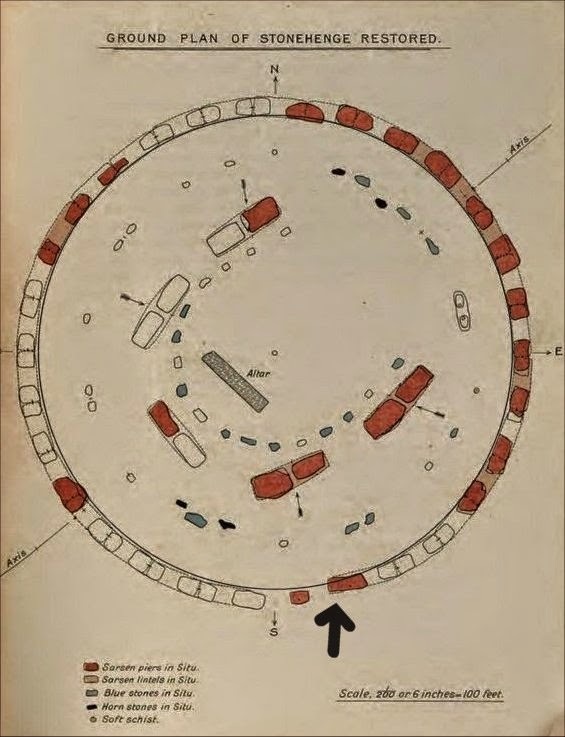 The plans below show the main alignment down the middle, this is the famous solsticial one for the midsummer sunrise and midwinter sunset. I have indicated these five possible twisted alignments, all of which point to the midwinter sunrise, and midsummer sunset. None on their own is complete proof that this twist was deliberate, and some are more certainly original than others. But all the features that cross the main axis are either perpendicular or at this angle; an angle that was marked in other monuments of this age. Please click the plans to enlarge them. 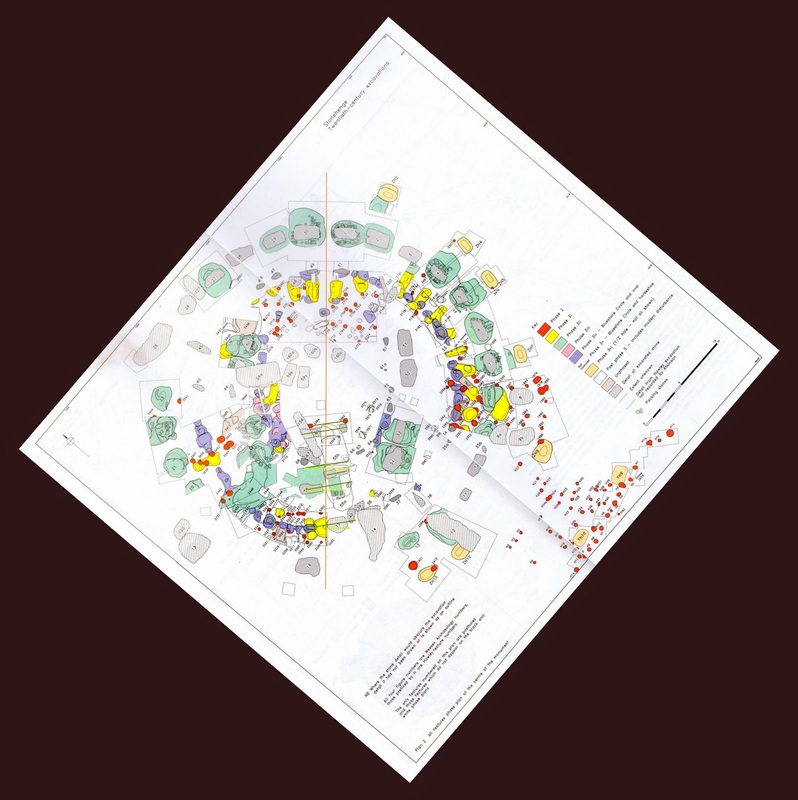 Plans are based on ones from Cleal et al. 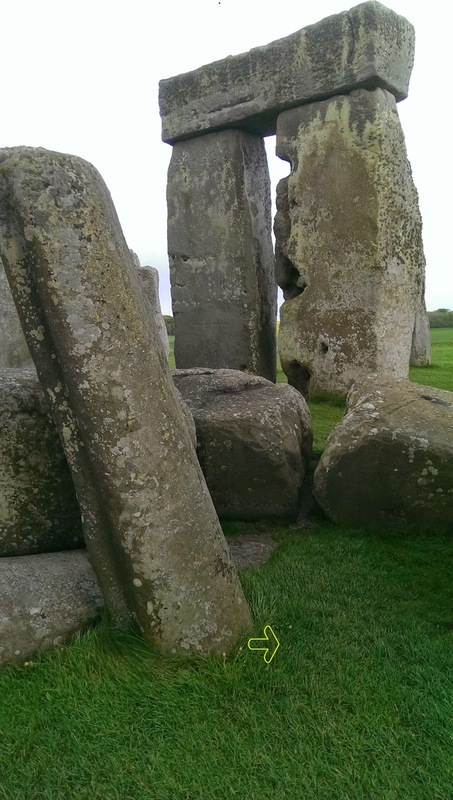 UPDATE - 17/5/14 Standing alone in Stonehenge yesterday it struck me that the alignment of 66 - 68 etc may just be aesthetic rather than alignments per se. 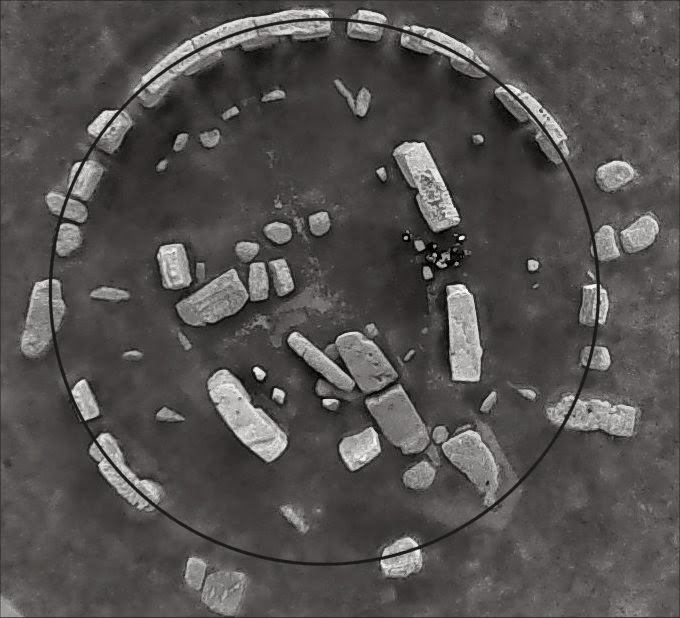 When the Great Trilithon was upright and dominating the centre it would have looked odd if the smaller stones in front of it were not at a symmetrical distance in front of it. Thus these other alignments may be seen as confirmation that the Great Trilithon was erected at the angle observed above. Stone 68 is leaning, but it is useful to note where it probably originally was. 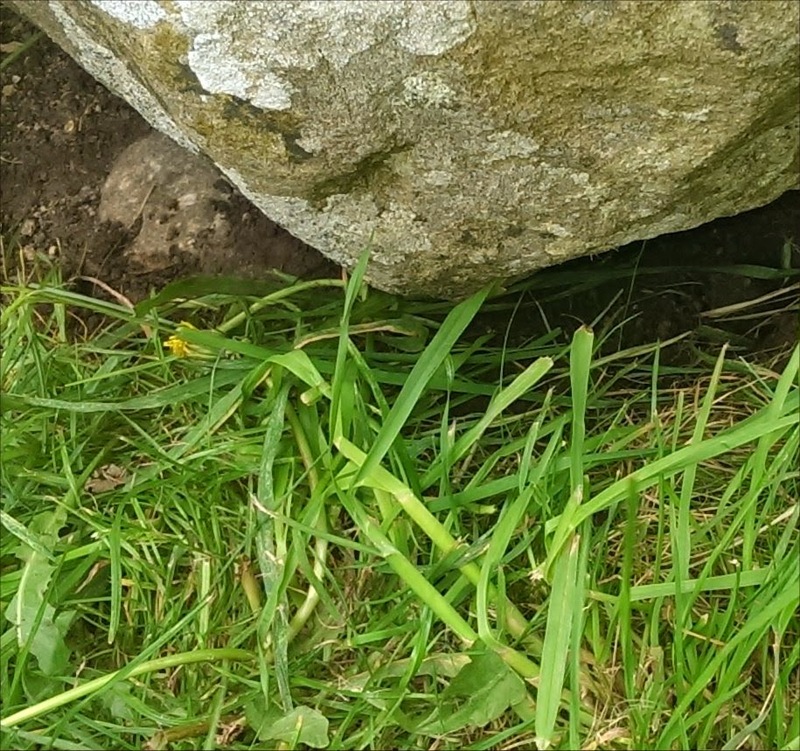 The original centre spot depends on how deep the stone is into the ground and how it is tilted. 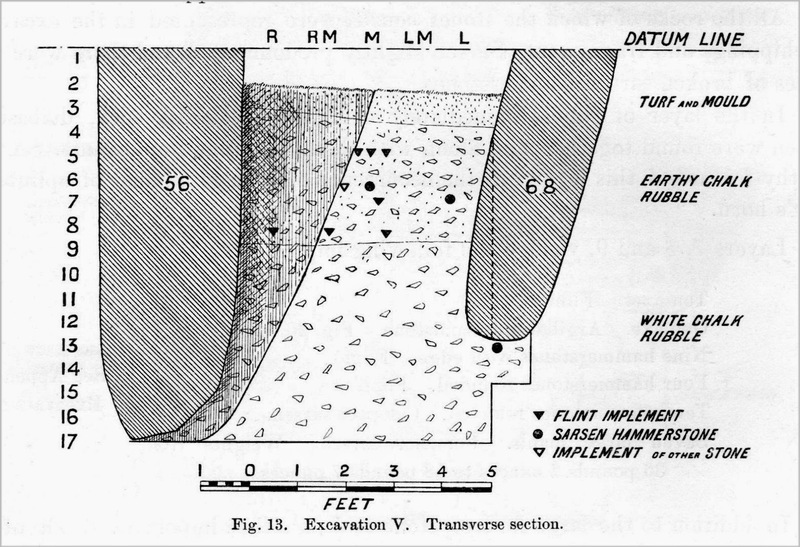 Gowland excavated the base of 68 and measuring the middle of the base to the middle of the ground level plan gives a lean of about 15 inches or 38 cm. I believe it would be fair to place it in line with the break between 55a and 55b when the plans are measured. Stone 66 can be seen in these photos just under the edge of 55b. The reason for the lean can be seen in old photos. 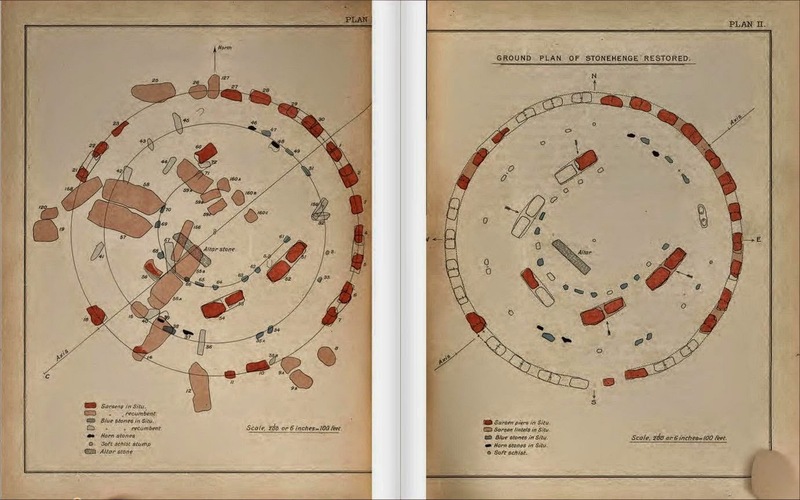 "A site with a page devoted to each stone at Stonehenge. This website is a work in progress toward that end. Not all stones currently have pages, but eventually they will have." 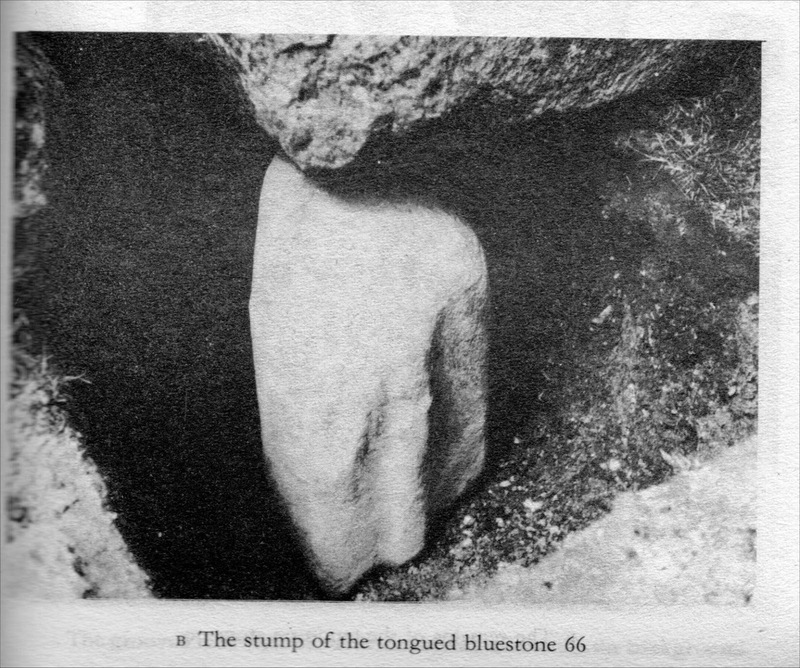 A surprise - Stone 66 is visible. I'm not sure if it is where a bunny has scratched or if I just have never noticed it before, but the beautiful smooth domed bluestone top is partially visible. More on Stone 66 at http://www.sarsen.org/2014/05/stone-66.html . 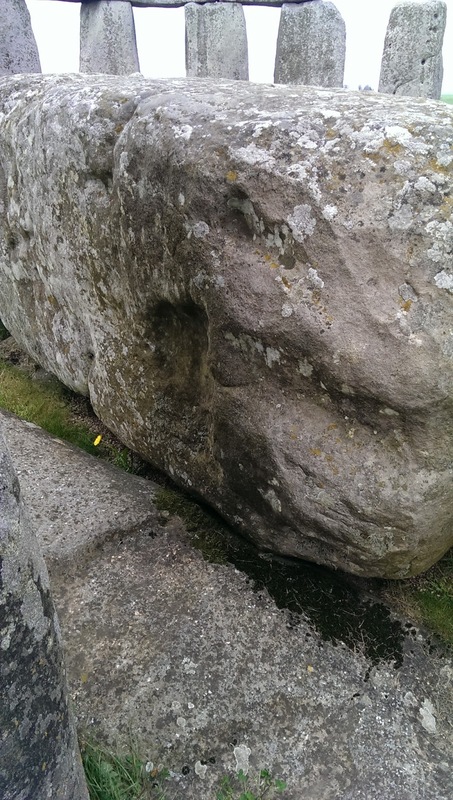 A couple of snaps of the Altar Stone where it lies protected from visitors' feet under Stone 55. I was surprised how rough it looks, it is described by Atkinson as being finely worked. Of course, I could only see a small section which was partially covered by soil, which a four legged furry friend had been disturbing, so looks may be deceiving. But if it is a roughly hewn rather than finely worked does this mean it is more likely to have been vertical once or not? It is cromulent to embiggen the pictures by clicking them. Twisted Stone 10, a problem solved. This plan is from Edgar Barclay's book of Stonehenge. I noticed that Stone 10 is marked as being twisted out of a true circular position. From the current EH guidebook, circle added. 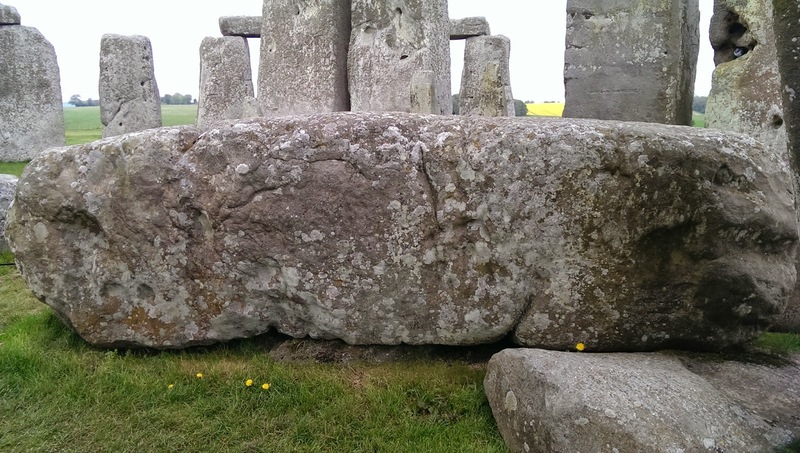 Stone 11 is out of line because it is leaning outwards, but 10 has never been restored or moved so it seems to be in its original position. Examining it on the ground the twist is quite obvious, and I have spent quite a few hours chewing over the problem as to what it could mean. Could it be related to the idea of 11 being an entrance way? This morning the solution came to me thanks to one of Adam Stanford's Aerial Cam photos. The ground level may be twisted but the top with the two tenons is exactly right. What amazing engineering! The published picture is misleading to me because it seems to be printed on its side. By turning it I can make sense of it. 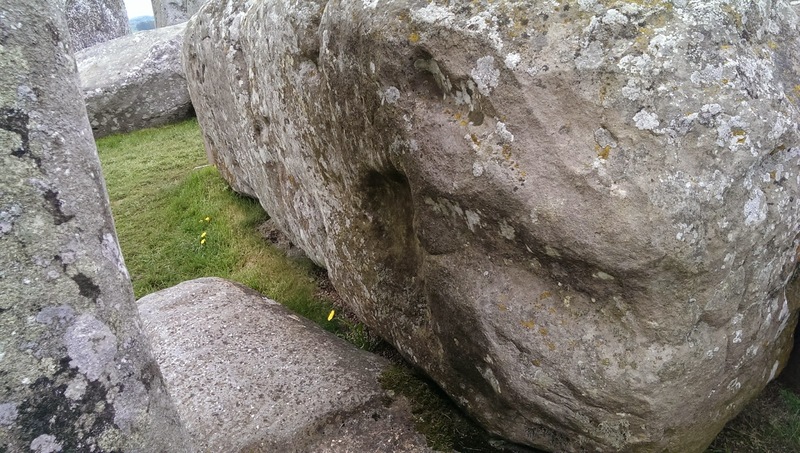 On what was the top of Stone 156, which was the lintel on top of the Great Trilithon, there are two holes which roughly correspond to the mortise holes on the bottom of it. 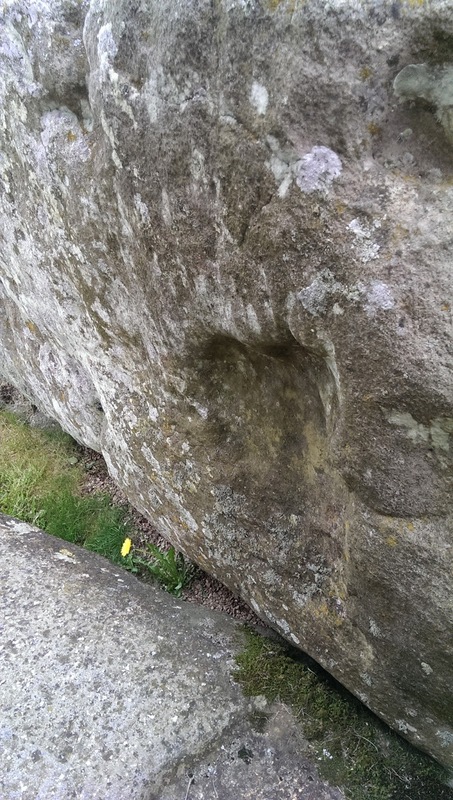 It is normally accepted that they were mistakes, that the stonemasons started chipping out the holes and then someone said," No, turn the stone over." I'm not convinced, other theories are that they may have held the bottom of a second storey of trilithons or that they may have held burning pots, though no heat fractures have been found. During Managed Open Access for Summer Solstice at Stonehenge, we support all individuals and groups conducting their own forms of ceremony and celebration providing that they are mutually respectful and tolerant of one another. It is a place seen by many as a sacred site - therefore please respect it and those attending. Parking and entry to the Monument will be free, subject to the Conditions of Entry. Please do not arrive at the Solstice car park or Stonehenge in advance of the opening times listed below. Please note: As Summer Solstice this year occurs on a Friday/Saturday, the roads around Stonehenge will be very busy. 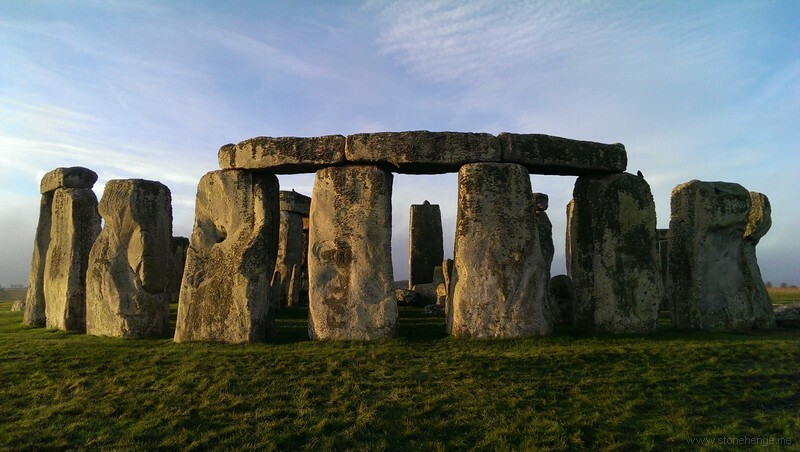 We strongly advise visitors to leave their cars at home and travel to Stonehenge using public transport. See Travel for further information. You can also follow @eh_stonehenge on Twitter for travel updates on the night. The meeting will cover puddingstones and silcretes of similar age in both the Hampshire and Paris Basins, and the weekend field trip will include East Hertfordshire/Essex, then Saint-Saëns and Sotteville in Northern France. It is anticipated that both the meeting and the post-conference field trips will lead to further co-operative research between archaeologists and geologists. Full details can be found within the draft PDF programme. I await the papers with interest. Barclay, Edgar. 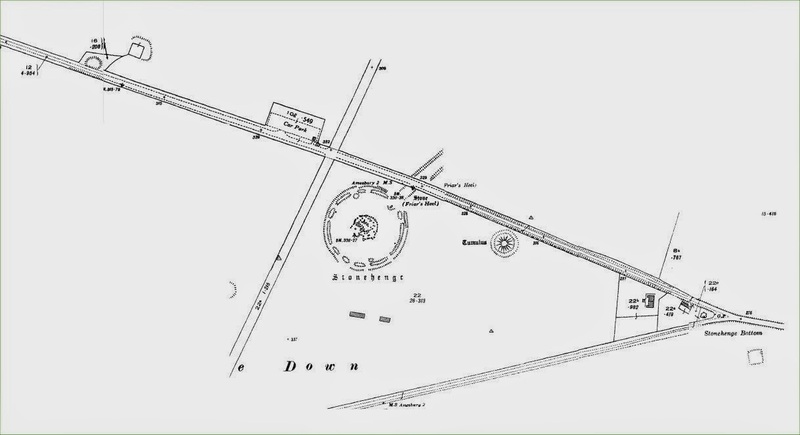 Stonehenge and Its Earth-Works. With Plans and Illustrations. London: D. Nutt, 1895. 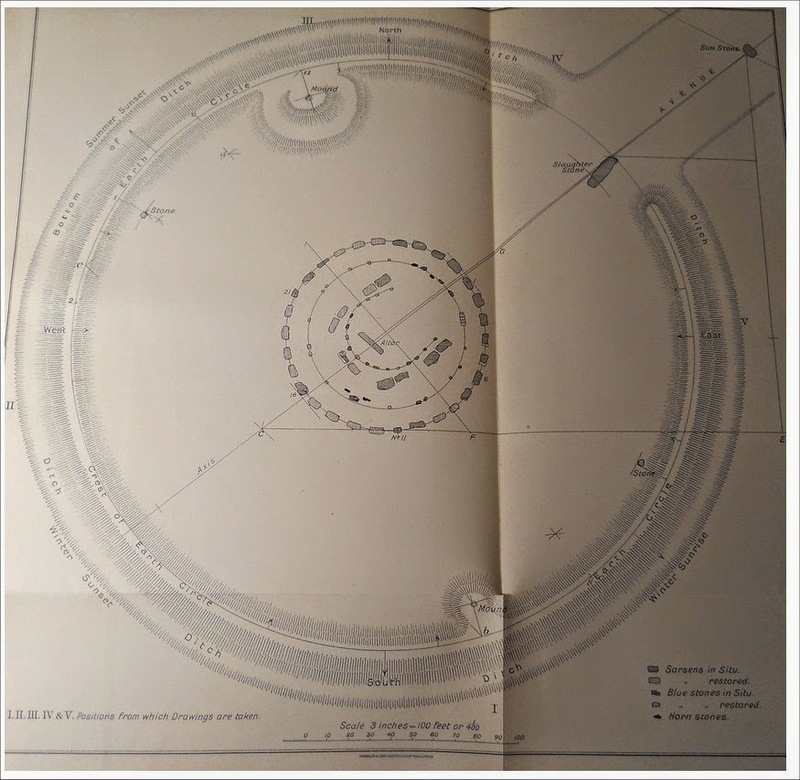 Fascinating and well illustrated book on Stonehenge.